Intricate lace patterns and stunning multi-coloured yarns don’t usually go together. 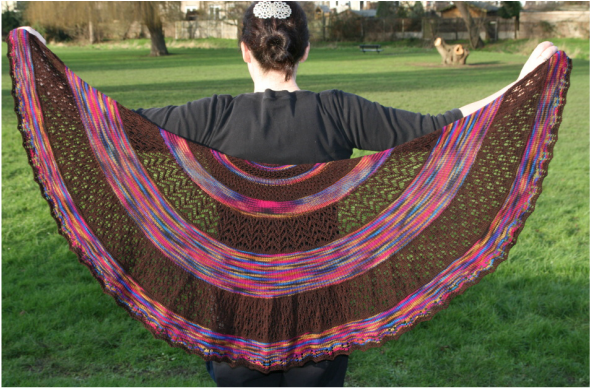 If you love to knit lace and love to use pretty multi-coloured yarns, this is the shawl for you. Worked from the top down, different lace patterns alternate with stocking stitch stripes to form a shawl that is both interesting to knit and striking to wear. The crescent shape is formed using Pi-shawl shaping, with increases at the edges to form a half-circle which is stretched into a crescent, helping the shawl to stay on your shoulders. The pattern includes both written and charted instructions. It is not necessary to work from charts in order to make this shawl. 3.75mm (US 5) knitting needles or size needed to achieve pattern tension of 10 sts and 18 rows to 2” in stocking stitch. You need to be able to: work yarn overs and KFB increases, single and double decreases on right and wrong sides (k2tog, p2tog, SSK, etc), work from either charted or written instructions.